When merging event files from observations with similar, but not necessarily identical, target coordinates, the event sky coordinates (X,Y in the event list) must be recomputed. This is often referred to as "regridding" or "reprojecting events to a different tangent point." It is necessary because the sky coordinates are computed relative to the nominal R.A. and Dec. for each individual observation, which will likely differ between observations of the same target. 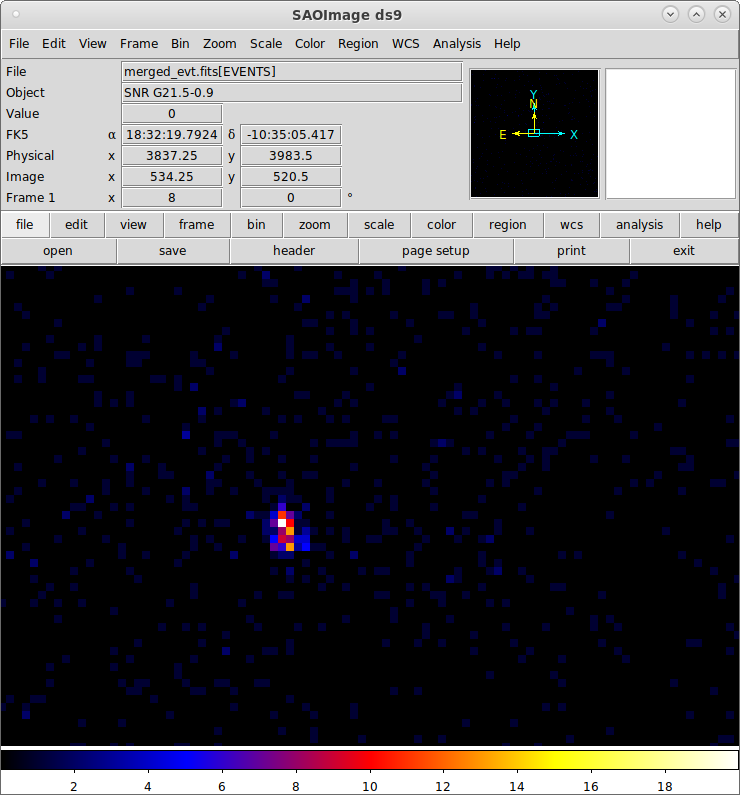 To combine ACIS or HRC imaging data from multiple observations, e.g. 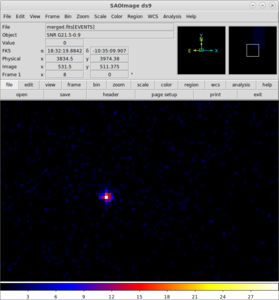 to search for faint sources or low-surface-brightness extended features. The merged event list should not be used for spectral analysis, since it does not contain sufficient information to generate correct response files. The recommended technique for the spectral analysis case is to generate separate PHA, RMF, and ARF files for each observation and to analyze them simultaneously. Last Update: 27 Nov 2017 - Added link to bug in DM that affects [cols eqpos] filtering. Merging about a Specific R.A. and Dec.
Each event list contains all the World Coordinate System (WCS) information required to transform between sky coordinates and celestial coordinates in its header. If the WCSs are accurate, one may merge event lists simply by converting sky coordinates in one event list to celestial, using that list's WCS, and then converting those celestial coordinates to sky coordinates in the second event list using the second WCS (see the ds9 thread coordinate definitions for more information). Using WCS Information to Merge: all the files are reprojected to match one file. Merging about a Specific R.A. and Dec.: the files are reprojected to a new tangent point that is different than any of the input observations. 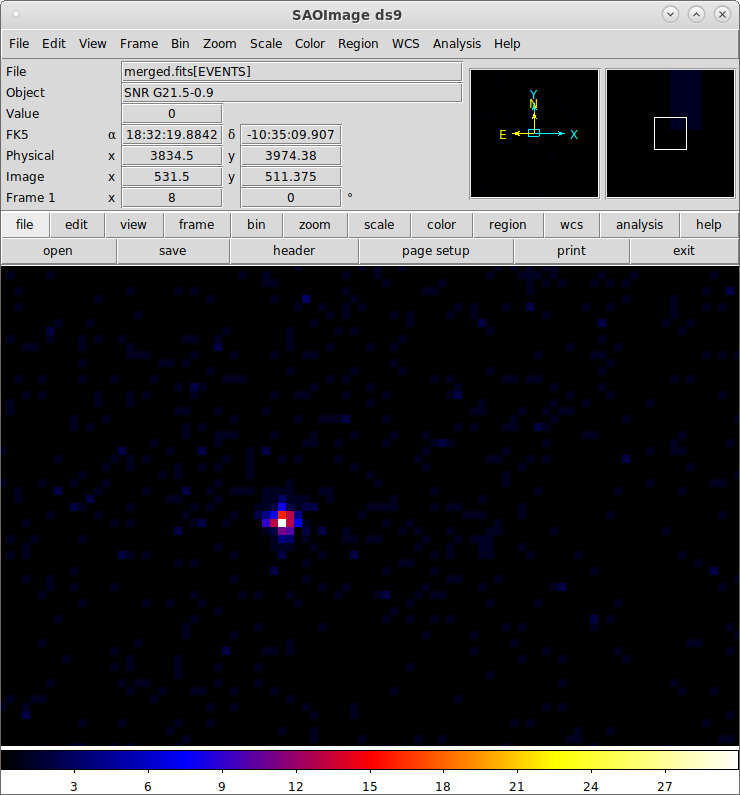 New tangent point: RA=18h 32m 11.496s Dec=-10d 34' 13.44"
reproject_obs infiles="1842,1843" outroot="merged1/" asolfiles="" merge="yes"
The appearance of the merged source - which has two peaks - suggests that there is a small systematic offset in the two WCSs. The source photon distribution in the merged event list appears as slightly double-peaked, indicating that there is in fact a small (2-3 pixels) systematic offset in the two WCSs. This may be minimized by first correcting the aspect, as described in the Correcting Aspect Prior to Merging section. It is also possible to reproject the events to a new tangent point that is different than any of the input observations. In this example, both event lists are reprojected to the arbitrarily chosen point (R.A.,Dec) = (278.086,-10.58625) prior to merging. unix% reproject_obs 1842,1843 merged2/ refcoord="278.086,-10.58625"
New tangent point: RA=18h 32m 20.64s Dec=-10d 35' 10.5"
reproject_obs infiles="1842,1843" outroot="merged2/" asolfiles="" merge="yes"
In order to improve on the results of the previous examples, we must address the problem of the systematic shift in the coordinate systems of the two event lists. To do this, we will shift the aspect solution of one to make it consistent with the other. If you choose to use this method, the shifted aspect solution should then be used throughout the rest of the analysis in order to obtain correct results. This is why we update the ASOLFILE keyword in the reprojected event file. First we determine what shift to apply to the data. In this case we use dmstat to calculate the centroid of the source in the two observations, but other approaches, such as using the positions calculated by wavdetect are also possible. There is a bug in the datamodel where the virtual EQPOS column cannot accessed in the same command where other regular column filters are applied. Therefor we filter the file first with dmcopy and then use dmstat to compute the mean RA and DEC coordinates. unix% dmcopy "1842/repro/acisf01842_repro_evt2.fits[energy=500:7000][sky=circle(4429,4093,5)]" - | dmstat "-[cols eqpos]"
unix% dmcopy "1843/repro/acisf01843_repro_evt2.fits[energy=500:7000][sky=circle(3815,3981,5)]" - | dmstat "-[cols eqpos]"
correct the delta RA by "cos(Dec)" to get a reasonable approximation of the distance between the two points. The tool wcs_update is used to apply the offsets. The shifts are input to the deltax and deltay parameters in units of sky pixels. Additionally, the WCS information from the event file for the match observation (1843/repro/acisf01843_repro_evt2.fits) is supplied in the wcsfile parameter. Note that the transformfile parameter is left empty. reproject_events does NOT preserve the sub-pixel improvements made by the EDSER algorithm in acis_process_events when the aspect parameter is not empty, as above. The acis_process_events tool can be used to preserve the EDSER improvements, but care needs to be taken if you have used non-standard settings previously with this tool to create the level-2 event file. # acis_process_events (CIAO): WARNING: The values of PHA, ENERGY, PI, FLTGRADE and GRADE may be inaccurate because doevtgrade=no. # acis_process_events (CIAO): WARNING: The values of ENERGY and PI may be inaccurate because calculate_pi=no. (as shown in Figure 2). The shift in the peak emission visible in earlier versions - such as Figure 1 - is no longer seen. which creates an image similar to Figure 2, although with different mapping between SKY and WORLD coordinates, because of the different tangent point. 15 Oct 2012 Updated to use reproject_obs rather than merge_all, which is now deprecated. The Correcting Aspect Prior to Merging section has been updated. 15 Mar 2013 Fixed links in manually merging section. 27 Jun 2013 Tweaked information in the distance equations. 02 Dec 2013 Review for CIAO 4.6. Noted that the PBK file for ACIS observations is no-longer copied/linked by reproject_obs. 16 Dec 2014 Reviewed for CIAO 4.7. Added a link to the merged datasets spectrum caveat. 27 Nov 2017 Added link to bug in DM that affects [cols eqpos] filtering.